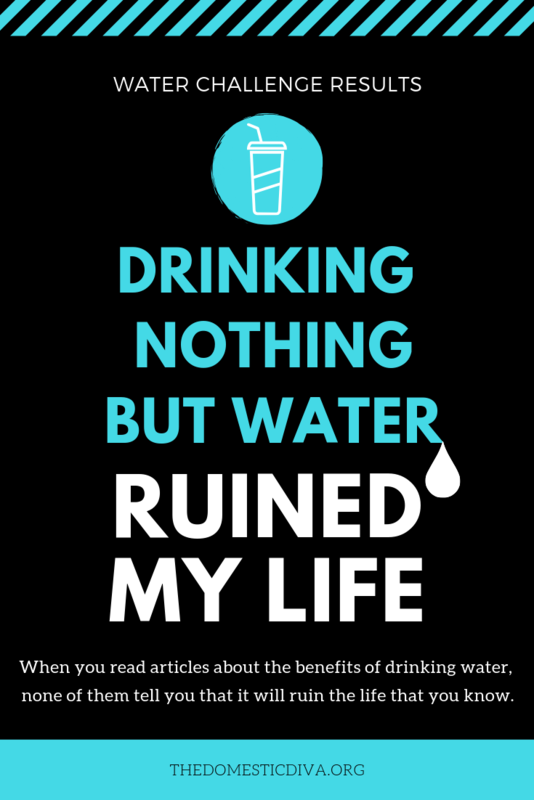 When you read articles about the benefits of drinking water, none of them tell you that it will ruin the life that you know. About 6-ish months ago I decided to make myself like drinking water. 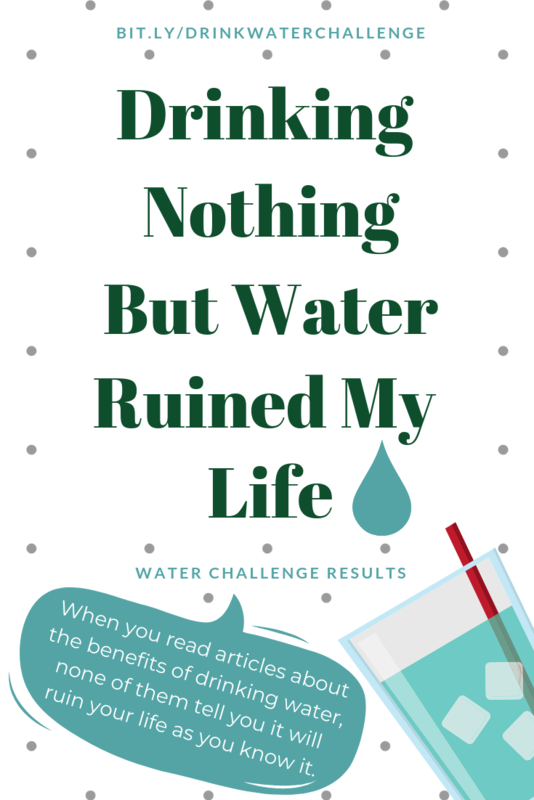 I hated the taste of water but I “knew” that it was good for me and that I probably should be drinking it. You read any health article and most if not all of them say to “drink more water”. The problem was that it was boring and just not tasty to me. I knew that if I really wanted to become a water drinker that I could “learn” to like drinking water just like I “learned” to like the taste of coffee back in college. When I started this quest, I had no idea the impact it would have on my life. I started the water challenge quite simply. One day after a bit of research, I decided to quit drinking all other beverages except water. Cold turkey. Drinking just water sucked in the beginning. Going from drinking a gallon of sweet tea in a day to adjusting to the taste of water was tough. I yearned to drink something sweet. But I resisted the temptation because I wanted this. I wanted to be a water drinker and actually like it. I know that 99.9% of any challenge is mental so, I knew I had to push myself mentally through this challenge and it wasn’t going to be easy. First, I had to figure out what would make me want to drink my water more. What would motivate me to keep filling up my cup with water. The first thing I did was to use my favorite cup. At the time, my favorite cup was a simple RTIC 20 oz. Stainless Steel Cup. This kept my water cold all day and I liked that. I found that if I made my water ice cold, like fill my entire glass with ice before adding actual water, made drinking water more tolerable in the beginning. After about a week, I added a stainless steel straw into the mix because drinking out of a straw just makes everything taste better. I would definitely recommend the stainless steel straws with silicone rubber tips on the end to protect your teeth. Getting through the first few days was the toughest. But I was dedicated to sticking with it. As soon as my cup was empty, I would go fill it back up with ice and water. I never let my cup be empty and I always had it with me. When I left the house, I took it with me. When I went upstairs, I took it with me. When I went to bed, I took it with me. When I ate at a restaurant, I took it with me because sweet tea in restaurants taste like sugar water to me now. My whole life it seems I’ve been dehydrated. Even though I gave up drinking soda and coffee several years ago, that still doesn’t mean I was doing any better in my choices since I never would drink water by itself. Instead of soda and coffee loaded with caffeine, I would drink sweet tea and fruit juice. It wasn’t until I challenged myself to drink water that I discovered that you can actually feel what it feels like to be properly hydrated. No one tells you that drinking water will take work. Making yourself drink water takes a lot of will power. Fighting dehydration is a battle you must conquer every single day. I know when I haven’t been drinking enough water throughout the day because by the time dinner rolls around I have a very mild headache brewing. If I don’t take the time to drink a couple of cups of water right away then my mild headache can turn into a full blown migraine real quick. It’s as if my body says to me, “drink the water now, or suffer the consequences later”. After several weeks of strictly only drinking water and no other type of beverages, I decided to purchase a bigger water bottle. I wanted to add the larger water bottle to my routine for several reasons. The main reason was because I was tired of having to stop what I was doing to go upstairs every few hours to refill my cup. The other reason is so that I can keep better track of how many ounces I am drinking throughout the day. I opted for a 64 oz water bottle because that it is how much water I am currently trying to drink every single day. 64 oz is half a gallon and perfect for me at this moment in my life. However, as I journey through life and grow more accustomed to drinking water on a daily basis that need may increase to a gallon, in which case I will only need to drink 2 64 oz water bottles to equal the equivalent of 1 gallon or 128 oz. You WILL see changes in your body, especially if you are dehydrated, it just might take longer than you anticipate. For me, I didn’t begin to notice any significant changes until well into my second month of drinking water consistently. If you make it to 30 days, that is fantastic but don’t stop there. You have to keep going. This challenge is a lifestyle change not a quick fix solution. I have been trying to hydrate my body for 30+ years with sugary junk. I know that a couple of months of drinking nothing but water isn’t going to be enough to give my body what it needs to thrive. I’m on the water challenge for life. There is a reason why water is the perfect beverage. Water gives every single cell in your body exactly what it needs to perform at its best. Get a water bottle you like (that makes you happy every time you see it) and dedicate it to only drinking water out of. The bigger the bottle the better. I like to use a 64oz Insulated Stainless Steel Water Bottle like this one. It saves you from having to refill all the time. But, if you like the feeling of refilling your bottle constantly because it helps you keep track of how much you have drank then use a smaller bottle. Get a straw if that’s your thing, it makes drinking water more fun. Add Ice if you like it really cold or drink it room temperature if that is more your thing. Stick with it till you like it. It might take 30 days or it could take 60, maybe even 90 days. Don’t give up. Keep. drinking. the water. Noticeable changes I’ve seen in my body after 3-ish months of drinking nothing but water. This may sound weird, but I can feel it in my veins. Drinking water has the ability to ruin your life as you know it right now. If you are not willing to change your routine or what you are used to, I would not recommend drinking nothing but water. The change you will more than likely see in your health will be positive. You will come across some uncomfortable situation like when you try to drink sweet tea from your favorite restaurant and be completely shocked by how sickening sweet it is. You will be amazed at how flavorful food tastes without the need for extra seasoning. Without a doubt, drinking water is beyond worth it. I wish I had challenged myself to drink water sooner. For me, the difference I feel in my overall health, especially with migraines, has been life changing. I know it seems so simple and that this isn’t some revolutionary health tip because you’ve more than likely read about it everywhere. But if you don’t typically drink water in your day, or maybe you grew up not drinking water like me I want to encourage you to start. No matter how you choose to start, drinking any amount of water throughout your day is going to be beneficial. I need to drink more water! I do drink a 16 oz. bottle before working out every morning but I mostly drink decaf sugar-free tea during the day. I need to up my water intake. I always order water when dining out. oh my gosh this is crzy ha- im not a huge water fan by nature so i try and do ALL the things to keep at least some water in my stomach. i def need to do it bc my skin is SO Dry and i know drinking water will help it out so much! Water is basically pretty much all we drink. Very rare we have a sugar flavored drink. We do make our own fresh juices. We don’t have a bunch of water bottles just get it straight from the tap. Great post! It really is a struggle to drink more water and most people (including me) walk around unknowingly dehydrated. I usually dilute my sugary drinks but I know water is best. I do try to drink mostly water. I couldn’t do ONLY water because I need my Diet Coke to remain friendly. But I always try to have a glass of water with lemon next to me. This is my first time learning about the water challenge. I defiantly need to step my water intake game up. I tend to drink less water during the colder months. Wow. 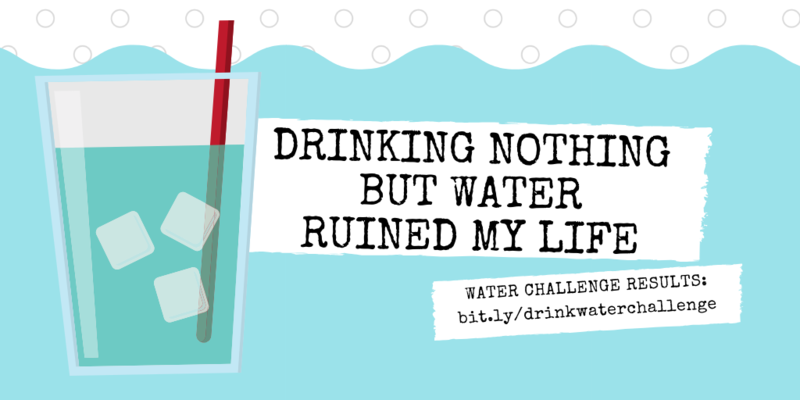 I know that increasing my water helps me lose weight and as for drinks – I only drink water, coffee and occasionally alcohol. I know that we need water, but I have heard of people overdoing it. I was never taught that there’s such a thing as too much water, but perhaps we do need to learn this at an earlier age. Drinking water is said to be a great thing to do but they don’t tell you about the downside. I stay hydrated during the day with seltzer because I could not drink plain water. I have to remind myself to drink water all the time. I actually usually only drink water when I do drink but I know it is not enough. I need to follow this challenge and make my body happy with me again. I HATE water – so so so so so much. That being said, I don’t drink anything with calories in it and everything I drink is always sugar-free as well. I adore CARBONATED beverages too so I generally drink Honest Fizz Zero or Zevia! I am like you in that I need to have a water bottle that keeps my water ice cold. I love it that way and I have to have a straw! I love the taste of water, I just forget to drink it. Every morning I get up with the intention of drinking lots of water and then just get too busy. I know that I should drink only water and a lot of it. I know that’s it’s healthy for my body, my skin and my brain. I should definitely start this challenge! You sound like my husband. The first time I met him, he live on sweet tea and then I started introducing him to water. He still love sweet tea but drinks water regularly now. A cup or two of coffee in the morning and then water the rest of the day. I don’t drink soda. But it is still a struggle for me to drink at least 8 glasses of water a day. Ugh! Still need to work hard on that one. Drinking water is definitely so beneficial. I don’t know if I can give up my Coke Zero though but, I do need to increase my water intake. Thanks for the reminder of how important it is. Yes I too need to drink more water, I like the benefits of drinking water you mentioned here. Even though with frequent bathroom visit drinking water have more benefits. I must do this. I am riddled with constant dehydration and I can never get enough water in my system.